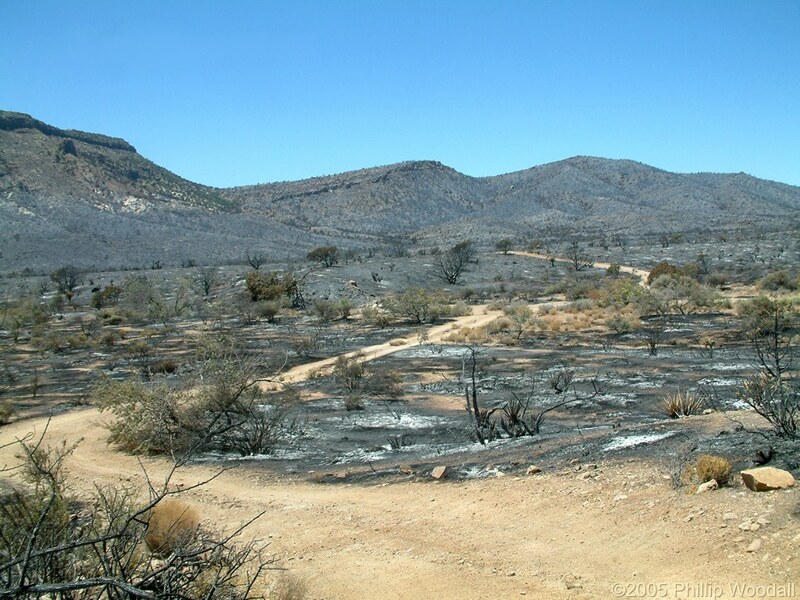 Photo: The north face of Wild Horse Mesa after the Hackberry Complex Fire, June 22-25, 2005. Eastern Mojave Vegetation The north face of Wild Horse Mesa after the Hackberry Complex Fire, June 22-25, 2005. This photograph, taken June 27, 2005, by Phil Woodall, was taken from Wild Horse Canyon Road. It shows the road to Winkler's Cabin and the north face of Wild Horse Mesa across the upper part of Wild Horse Canyon. Wild Horse Canyon Road - Mojave National Preserve: n. face of Wild Horse Mesa. Effects of the Hackberry Complex Fire in Mojave National Preserve, June 22-25, 2005.: 232310. Other photos about Geography - Eastern Mojave or Wild Horse Mesa.